8 registered (+8Rich, petemog, John Winn, Dada, B3MOG, WOX9, Bishmog, Birchenall), 114 Guests and 12 Spiders online. Well spotted. Let's hope it gets a UK airing. The 3 episodes are offered on www.amazon.COM and there via the payment channel ACORN tv. Damn don't have those. It looks a great programme. I've seen the first one (Inverness to Skye) and have episodes 2 and 3 on the PVR - London to Land's End down the A30, and Cardiff to Snowdonia through mid-Wales, I think. I very much appreciate the sentiment behind the programme. Years ago (as a spotty teen, must have been somewhere around 1984 or so, I think) I navigated for my dad driving his 1930 Austin 7 from Warminster to Chester: we had a 1930 RAC atlas and guidebook, and kept to a route consisting only of roads that had existed when the car was built: no motorways, no bypasses, a wonderful journey via Chippenham, Cirencester, down the Birdlip hill (that was quite interesting...) into Gloucester and then along the Marches via Ludlow, Shrewsbury and Wrexham. With a (not quite in keeping with the times) portable transistor radio tuned to Radio 4 long wave for Test Match Special. although as intimated above this you can do the free trial through amazon prime, so don't have to give your card details to a third party. It appears to be a service that allows views outside of the UK to watch British programmes. I suppose it's appropriate that the service isn't available if you are in the UK (I just tried!) but slightly ironic given that this particular show hasn't been broadcast here! 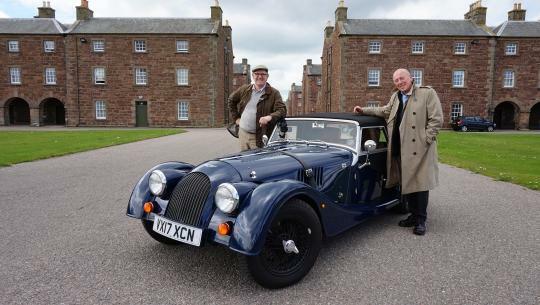 Just seen it starts next week on CH4 at 8PM As "Great British Car Journeys"